Public Safety Video | Donnegan Systems Inc.
See how Donnegan Systems can help with your Evidence Storage, Personal Storage, and More. Your evidence room is overflowing with items – from weapons to narcotics to the occasional car bumper – and they just keep coming. With finite storage space comes a host of other issues: wasted time, misplaced evidence, unsafe evidence warehouses, & difficulty disposing of old evidence. Donnegan offers standard, refrigerated, and heavy duty options to ensure your chain of custody is secure from deposit to disposal. For nearly 40 years, we’ve worked with law enforcement professionals to design storage systems that take into account their current processes and solve their biggest challenges. The advances in DNA technologies are increasing the amount and duration of evidence being stored by law enforcement agencies. At the same time, Property and Evidence Technicians are afraid to purge evidence as new laws are enacted, extending the statues of limitation related to specific cases. These storage space are small to begin with—and is now filled beyond capacity with no room for future items. Utilizing a high-density mobile public safety storage system for long-term evidence storage is the most effective way to significantly increase space and create best practices related to evidence protocol. Compact, organized storage can reduce the risk of lost evidence as well as the time spent searching for evidence, freeing up technicians for processing and research. 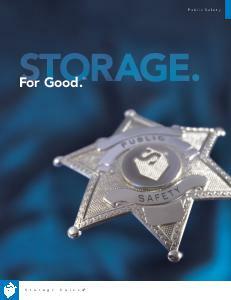 Download our brochure to view all Public Safety storage solutions. Donnegan Systems has helped law enforcement agencies across New England and Eastern NY. Let us show you how to look at space a whole new way.